Young people with additional needs face challenges in making their transition into adult life. Challenges such as marginalisation, isolation, and uncertainty - a result of lack of opportunities in learning and in the workplace. Our Freedom2Choose programme provides recreation and social space, skills development and supported events/activities independent of families and carers. The programme provides structured opportunities for young people to express themselves, have new experiences and learn new skills, in addition, the programme aims to develop social and communications skills, confidence, and self-esteem. 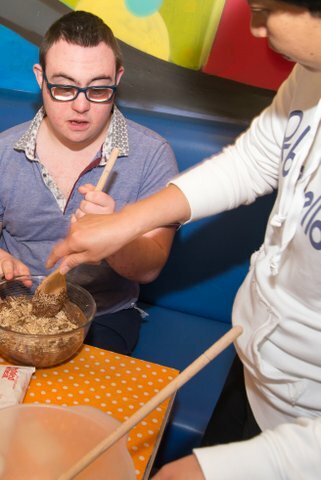 Our latest Freedom2Choose session gave young people an opportunity to gain independent living skills. An Easter-themed session, service users baked Chick Nest Buns, Easter Rocky Road Buns and created Easter cards for special people in their lives - skills they can now use next Easter at home. Then it was time for fitness dance to offset the calories from the sweet treats and everyone got the chance to wish Malcolm & Lynne Happy Birthdays whilst enjoying lovely Chocolate Cake brought by Malcolm. We hope you all had an egg-citing Easter!